Yupha Miriam Hasitavej obituary. Carnes Funeral Home. 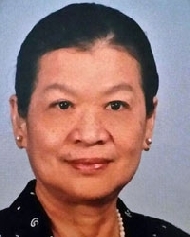 Yupha Miriam Hasitavej (nee Srichandra) was born in Bangkok, Thailand to her now deceased parents Dr. Leng and Mrs. Ob Srichandra on June 14th,1929. She went to Heaven on May 12th, 2014 at the age of 84 in Clear Lake, TX. She is predeceased in death by her brother Dr. Lert Srichandra. Yupha is survived by her childhood sweetheart and devoted husband of 56 yrs Dr. Rasmee Hasitavej, her children, Marisa Kullavanijaya Hasitavej, Marie (Aleksander) Bilinski and Manop Don Hasitavej; her sister, Renu Lancaster and numerous relatives around the world including Thailand, Australia, Ireland, the Phillipines and the US. Yupha was educated in London England and graduated with BS degree from the University of Dublin in Ireland. She immigrated to the US in the 1950’s and proudly became a US citizen in the 1960’s. Yupha was a devoted mother and wife, avid fisherman (truly caught the big ones! ), exceptional gardener, cat lover, and outstanding Thai cook. She will be remembered for her generosity, delightfully quirky laughter, affectionate touches, frankness and strong will power steeped in her religious beliefs. Yupha will be deeply missed and has left her indelible “finger print” in our hearts. Special thanks to the Vantage Hospice team, Kimberly, Rosa, Candice and MacKenzie. Yupha’s funeral Mass will be held at St. Bernadette’s Church, 15500 El Camino Real, Houston, TX 77062 on Thursday 6/5/14 at 10:30 a.m. with luncheon to follow.